This plant originates in China and Taiwan and is known as Chouchun (which literally means foul smelling tree). It is a medium-sized deciduous tree (15-30m) found in temperate climates and can grow up to 15m in just 25 years. They rarely live longer than 50 years but they have an amazing ability to sucker freely so it can clone itself many times over. Because they are attached to the mother tree they are partially supported by it, therefore less vulnerable than seedlings. 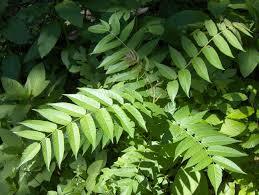 The leaves are large, pinnately compound, alternate 30-90cm long with 19-41 leaflets in pairs. The central leaf axis is light to reddish-gree with a swollen base. The leaflets are ovate-lanceolate with entire margins, occasionally not directly opposite to each other. The leaflets are 5-18cm long and 2.5-5cm wide with long tapered ends. They are dark green above with light green veins and paler below. The flowers are small in large panicles up to 50cm long at the end of new shoots. The flowers are yellowish green to reddish with five petals and sepals. Male and female flowers grow on different trees. Male trees produce 3 to 4 times as many flowers as the female trees and emit a foul-smelling odour (which is why it gets the name Chouchun) while flowering to attract pollinating insects. Dispersal is by seed and prolific suckering from shallow roots. The seeds are 5mm in diameter, enclosed in a papery wings (samara) that are 2.5cm long and 1cm broad. The samara are quite large and twisted at the tips, making them spin as they fall. This tree has a long history in traditional Chinese medicine - it is claimed to fix anything from mental illness to baldness! The roots, leaves and bark are all used in Chinese medicine still today, mainly as an astringent (as a compound that shrinks or constricts body tissue. It has become an invasive species due to its excellent ability to both colonise disturbed areas quickly and also its ability to suppress competition with allelopathic chemicals (biochemicals that influence the germination, growth, survival and reproduction of other organisms). If cut down or burnt it re-sprouts vigorously so it is best to pull small seedlings and stem inject larger plants with 100% glyphosate. This weed is a Class 4 weed, which means the growth of the plant must be managed in a manner that continuously inhibits the ability of the plant to spread and the plant must not be sold, propagated or knowingly distributed.